The journey of "Titanic" begins in the present, at the site of the ship's watery grave, two-and-a-half miles under the ocean surface. An ambitious fortune hunter (Bill Paxton) is determined to plumb the treasures of this once-stately ship, only to bring to the surface a story left untold. The tragic ruins melt away to reveal the glittering palace that was Titanic as it prepares to launch on its maiden voyage from England. Amidst the thousands of well-wishers bidding a fond bon voyage, destiny has called two young souls, daring them to nurture a passion that would change their lives forever. 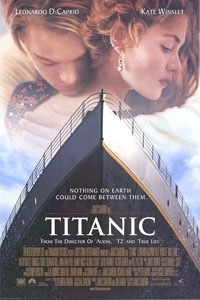 Rose DeWitt Bukater (Kate Winslet) is a 17-year-old, upper-class American suffocating under the rigid confines and expectations of Edwardian society who falls for a free-spirited young steerage passenger named Jack Dawson (Leonardo DiCaprio). Once he opens her eyes to the world that lies outside her gilded cage, Rose and Jack's forbidden love begins a powerful mystery that ultimately echoes across the years into the present. Nothing on earth is going to come between them -- not even something as unimaginable as the sinking of Titanic. To the question of the day--what does $200 million buy?--the 3-hour-and-14-minute ''Titanic'' unhesitatingly answers: not enough. campaign or put a serious dent in illiteracy, the answer is not nothing. When you are willing to build a 775-foot, 90% scale model of the doomed ship and sink it in a 17-million-gallon tank specially constructed for the purpose, you are going to get a heck of a lot of production value for your money. Especially if your name is James Cameron. minutes to a bit more than an hour) compels our interest absolutely. But Cameron, there can be no doubt, is after more than oohs and aahs. He's already made ''The Terminator'' and ''Terminator 2''; with ''Titanic'' he has his eye on ''Doctor Zhivago'' / ''Lawrence of Arabia'' territory. But while his intentions are clear, Cameron lacks the skills necessary to pull off his coup. Just as the hubris of headstrong shipbuilders who insisted that the Titanic was unsinkable led to an unparalleled maritime disaster, so Cameron's overweening pride has come unnecessarily close to capsizing this project. For seeing ''Titanic'' almost makes you weep in frustration. Not because of the excessive budget, not even because it recalls the unnecessary loss of life in the real 1912 catastrophe, which saw more than 1,500 of the 2,200-plus passengers dying when an iceberg sliced the ship open like a can opener. What really brings on the tears is Cameron's insistence that writing this kind of movie is within his abilities. Not only isn't it, it isn't even close. completely derivative copy of old Hollywood romances, a movie that reeks of phoniness and lacks even minimal originality. Worse than that, many of the characters, especially the feckless tycoon Cal Hockley (played by Billy Zane) and Kathy Bates' impersonation of the Unsinkable Molly Brown, are cliches of such purity they ought to be exhibited in film schools as examples of how not to write for the screen. One reason this version is so long is a modern framing story involving nautical treasure hunter Brock Lovett (Cameron veteran Bill Paxton), who is scouring the Titanic's wreck (it was located in 1985) for a fabulously expensive blue diamond called ''The Heart of the Ocean'' that was lost on board. 17-year-old wearing a very large hat and metaphorical shackles. ''To me it was a slave ship,'' she recalls, ''taking me to America in chains.'' In plainer English she was being forced by her snooty mother Ruth DeWitt Bukater into a (gasp!) loveless marriage with Cal Hockley, an arrogant and wealthy snob for whom the phrase ''perpetual sneer'' was probably invented. Rose may be a 17-year-old, but she knows a thing or two. She makes offhanded references to Freud, a wise gentleman no one else on board has heard of, and during an impromptu shopping spree she managed to buy works by Picasso, Degas and Monet despite Hockley's dismissive belief that they ''won't amount to a thing.'' Clearly, this prodigy of taste and discernment deserves better than Mr. Perpetual Sneer, no matter how rich he is. Enter Jack Dawson (Leonardo DiCaprio), a madcap artist and cherubic scamp who wins his steerage ticket in a dockside card game. Jack is staggered by a glimpse of Rose, and though a conveniently placed Irish lad advises him ''you'd as like have angels flying out of your arse as get next to the likes of her,'' he's not the kind of young man to give up easily.